The post war years were not only important times for furniture and architectural design but indeed for many of the creative arts. The competitions held by the Museum of Modern Art (MOMA) in New York famously catapulted the furniture designs of the Eames Office into the public eye. But relatively little people realize that Ray Eames was also involved in the 1947 MOMA competition for fabric design and succeeded in attaining an honorable mention for their Eames fabric designs, something of an accolade for a designer with no formal training in the field. Ray submitted two Eames Fabric designs to the competition in 1947 with the 'Sea things' pattern attaining her the special mention. This design was taken on by Waverly products in the mid 60’s and transferred onto their serving trays and Catch It All Table designs. 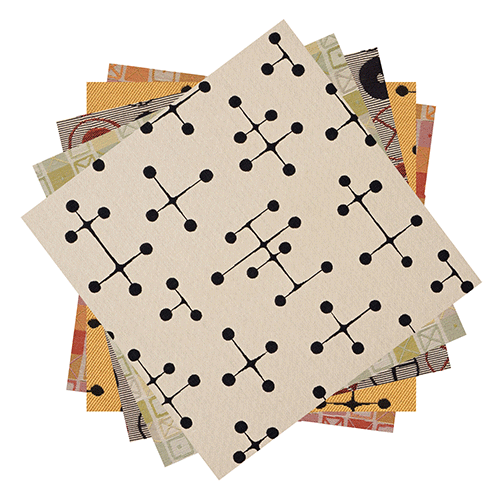 She would also go on to produce the now famous Eames Dots design as well as others. Original yards of fabric produced during the time are very rare indeed and fetch extremely high prices today. Luckily, many of them are reproduced today through manufacturers such as Maharam.